SkillsTEC is a specialist and dedicated training company for all disciplines of working at height. 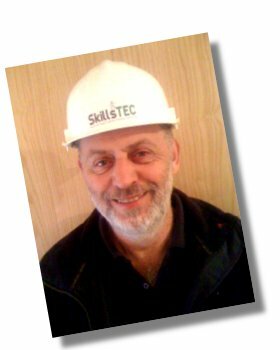 Although SkillsTEC is a newly formed company that started in March 2012, I have 30 years experience working in all areas of the access industry, including hire & sales and operation of all types of access equipment. Having been employed as work at height safety trainer within a multi-disciplined access company for the last 8 years, I have been instructor for IPAF, PASMA and LADDER ASSOCIATION. I have written specific courses such as 'Roof Access - Utilising Ladders' for solar installers and maintenance workers. IPAF training courses are the industry accreditation for MEWP operators (cherry pickers, scissor-lifts, lorry-mounts, spiders and tow behind machines). PASMA training courses industry accredited mobile tower, low level access equipment (podiums etc.) and the only accredited general work at height course that offers a certificate and photo identity card. LADDER ASSOCIATION training courses for both users and inspectors. Yes there is an industry accredited body that has been around since 1947 which is dedicated to promoting the correct use of steps and ladders. HARNESS training courses, either IPAF specific for machine operatives, or a general 'all areas' course for people who need to use a harness in more than one area.